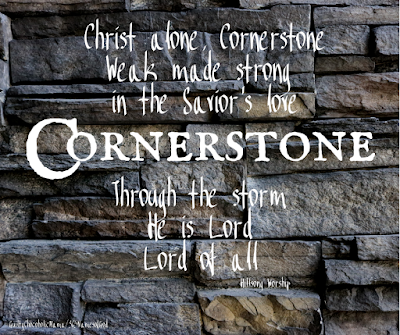 I love the way God's names magnify both His diversity and His consistency: He is so many different things, but He is also reliably so many of the same thing. "Warrior"—with its implications of battle and fighting and strength and righteous wrath—stands in seeming contrast to gentler-sounding names like Song and Protector. But all God's names reinforce each other, for He can neither be less than He is nor other than He is. The Shepherd is also the Warrior who will fight to protect His sheep. The Quieter of His people is also the Warrior who shouts on their behalf. The Singer is also the Warrior whose song is sometimes a battle cry. 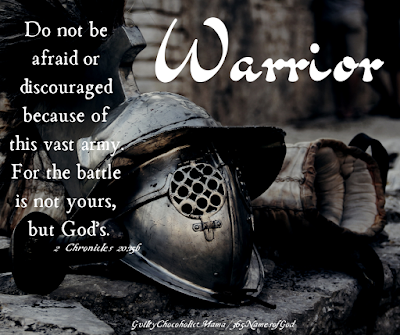 Hear the Warrior's declaration to an assembly seeking His help in the face of an imminent attack by an intimidating enemy; it is still what He is saying to us today: "Do not be afraid or discouraged because of this vast army. 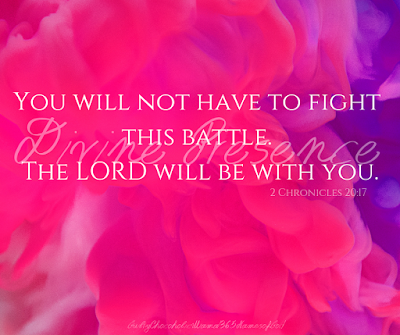 For the battle is not yours, but God’s" (2 Chronicles 20:15b NIV). 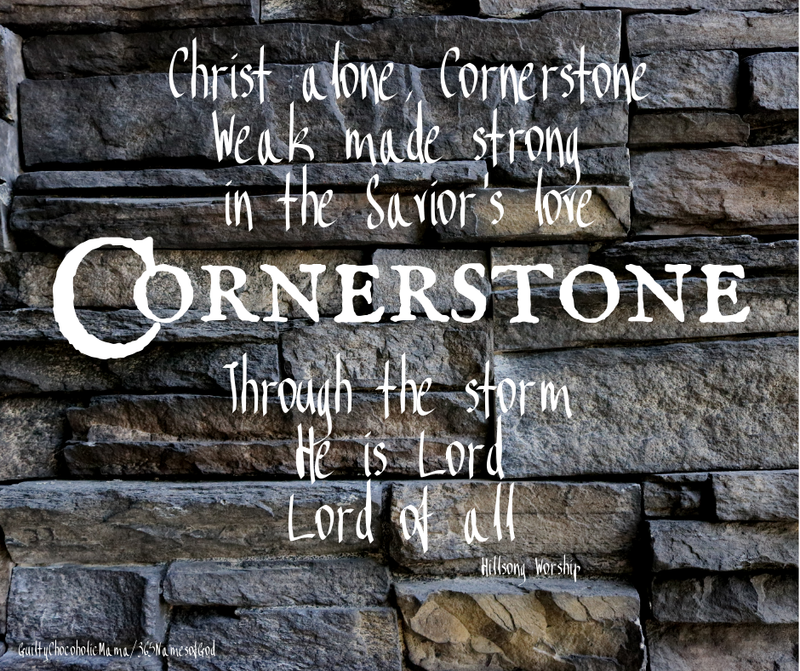 One of my favorite hymn lines is from "A Mighty Fortress Is Our God": "The prince of darkness grim, we tremble not for him. His rage we can endure, for, lo, his doom is sure." The enemy's doom is not in doubt. Whatever spiritual battle you're fighting right now is not ultimately yours but God's. And His victory—the spoils of which He allows you to savor—is sure, to the end. Our family was eating dinner together one night a couple years ago, and my husband and I were discussing a subject whose "back story" was unfamiliar to our daughters but familiar to my husband and me. I had just made some comment on the topic, and my husband replied with, "Did you ever--," at which point I (gently) interrupted and said, "No." To which he replied, with complete understanding and satisfaction, "Oh." One of our daughters looked at him and asked, "Did mom answer the question you were asking?" He told her "yes" without hesitation. Which I already knew, because: 1)married a long time; and 2)context. We need some context to fully appreciate the magnitude of today's name of God. The culture to which the prophet Isaiah would have been making his superlative declaration was polytheistic: lots of worship of little-"g" gods. The idea of one, true, real, big-"G" God who actually acted on behalf of people who trusted in Him was so radical, so revolutionary that no one had ever heard or seen anything like it. In fact, the very concept of The Great I AM is so radical and revolutionary that only God could have come up with it. Oh, do you see it? Only God could have come up with the idea of Himself. This is probably a good place to emphasize, though, that God did not invent Himself. He is the Creator, but He is uncreated. The I AM always has been. And if this is something we just can't quite wrap our human minds around, that is a very good thing indeed, because don't we need a God bigger than our biggest thoughts? A few days ago, I suggested that you might want to insert your name into one of our daily Scriptures to personalize it. I don't want to employ this tool so much that it becomes dull from overuse, but today's verse seems ripe for that application. Fill in the blank with your name, beloved of the Lord, and then wait to see what sort of acts our incomparable God will do on your behalf. "From ancient times no one has heard, no one has listened to, no eye has seen any God except You, who acts on behalf of ____________ who waits for Him" (Isaiah 64:4 CSB). If you grew up in a hymn-singing church or if you attend one now, have you ever found yourself singing a word and thinking, "What in the world is this talking about?" Such was the case with the timeless hymn "Come, Thou Fount of Every Blessing" and the phrase, "Here I raise my Ebenezer." I was always pretty sure it had nothing to do with Scrooge or with Dickens' A Christmas Carol. But that was as far as my understanding went until the worship team I'm blessed to be part of decided that if we were going to lead our congregation in singing about "Ebenezer," we'd better teach about it first. 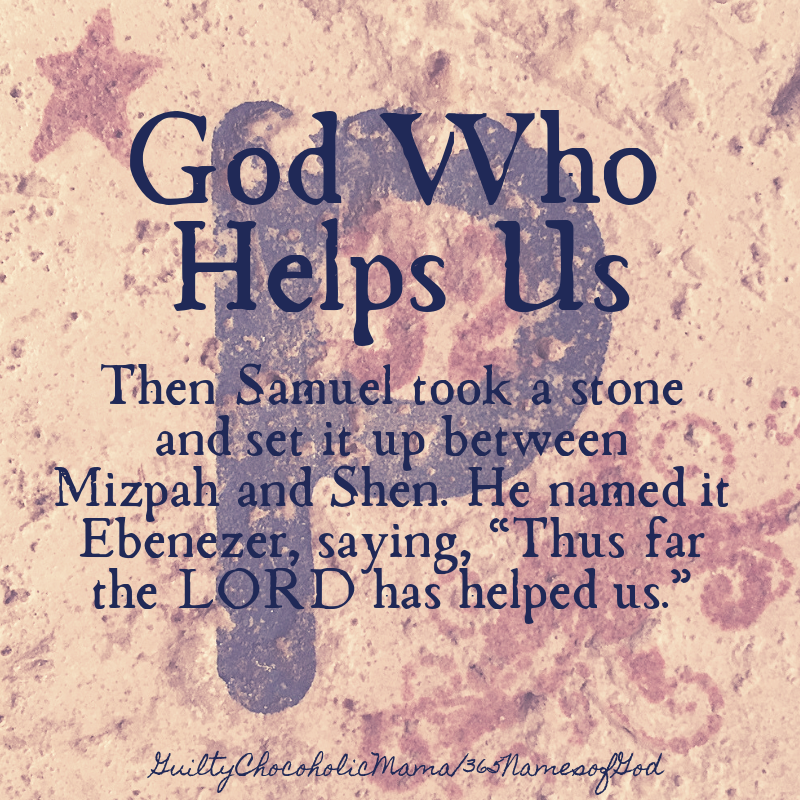 "Ebenezer" means "stone of help," and in its original context, it is a rock of remembrance: God had just led the Israelites to an improbable victory over the Philistines, and so the prophet Samuel set the Ebenezer stone up as a physical testimony to what God had done. The idea was that in the future, people would see the stone and ask about it, and someone would again tell the story of God's provision of help. This is so good to know, because rehearsing what God has done builds our faith. We act on what we remember, so recalling God's past activity informs our present actions. Several seasons ago, my ladies' Bible study group learned about the Ebenezer stone, and at our closing spring brunch that year, two of our craftier members (read: not me) gifted each of us with our own rock of remembrance: a stone coaster stamped with a lovely design and a P (short for the name of our group, Proverbs 32...which is a story for another time). My coaster sits within arm's reach of where I'm working right now, and when I see it, I remember: "thus far the Lord has helped me." 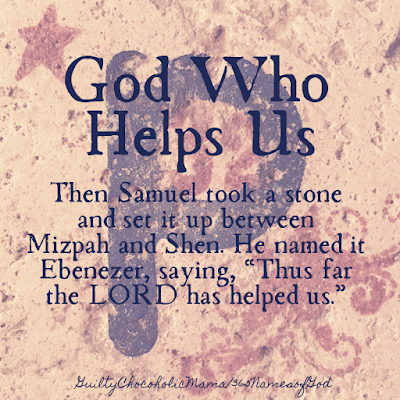 Sweet friends, perhaps you'll want to raise your own Ebenezer somewhere in your house or yard: a "stone of help" you'll see every day that will both remind you—"thus far the Lord has helped me"—and reassure you: "And He will help me further still." Song suggestion: "Come Thou Fount of Every Blessing;"
https://www.youtube.com/watch?v=ax_NMWLEb6U; Chris Rice; original hymn lyrics by Robert Robinson. When I think of God as my Lamp, I picture something along the lines of a 6000-lumen, LED "tactical flashlight" capable of spotlighting a good long stretch of the road ahead of me. I imagine this gives God a good laugh, because in fact the sort of lamp mentioned in today's key verse and in other Old Testament passages would have been a small clay bowl holding oil and a bit of flax or linen serving as a wick. The glow this "lamp" produced would have provided just enough light for the person holding it to see to take the next step directly in front of him or her. God is big on us just taking the next step and trusting Him with what lies in the darkness beyond that. Stepping in the light of what we can already see is called gratitude, but faith requires trusting in what we can't see yet—and, more to the point, trusting in the Lamp who CAN see it and is already there. Faith pleases God. It makes Him happy, and He rewards it. 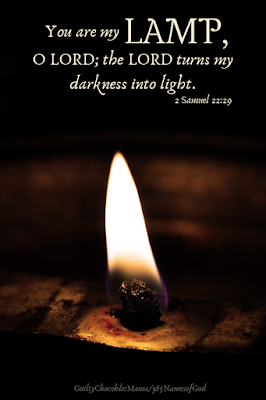 Oh God, our Lamp who turns our darkness into light, help us fill our clay bowls with the oil of wisdom, hope, and confidence in who You are. Help us to light this oil with the fire of faith. And help us then to take the next step on the piece of the path You illuminate for us. Song suggestion: "Thy Word," Amy Grant, https://www.youtube.com/watch?v=9OTVuGaiTsE. "You will not have to fight this battle." Of all the divine declarations in Scripture, this has to be one of the most glorious. There are indeed battles God calls us to fight—with His help, of course. But this example is proof that not every battle we face is for our fighting. Sometimes, we just have to take the steps God lays out for us leading up to the battle and then stand still in His presence and watch Him do the fighting, watch Him hand us the victory. 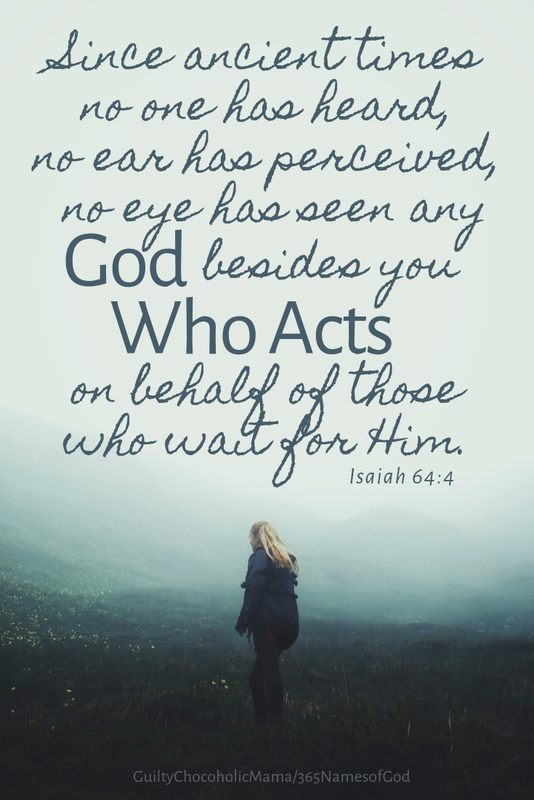 To be sure, King Jehoshaphat and his troops had a job to do, and it might have been a harder job than all-out fighting in the first place: they had to show up, stand firm...and then wait to see God do His thing. Divine Presence was promised to them—"the LORD will be with you," not "the Lord might be with you"—but they had to "go out to face" the enemy first. At the risk of sounding like a greeting card, God's presence is a present. 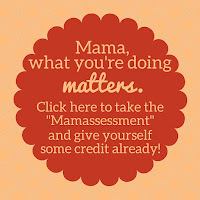 It is a gift we receive, not a paycheck we have to earn. But God often overlays His presence atop our show of faith and obedience. Sweet friends, are you staring down a battle today? If so, is it one God wants to fight with you or one He wants to fight for you? 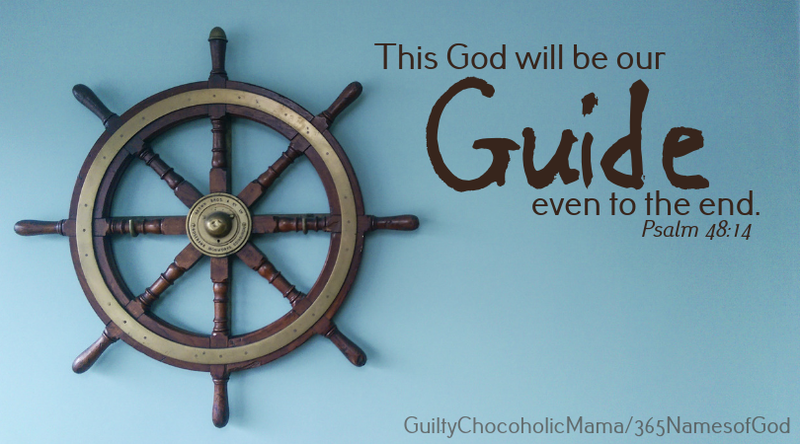 Either way, "go out" and face what needs facing with this assurance: "the LORD will be with you." Sometimes I find myself mumbling to myself, "I just want...peace." I think what I'm really wanting is to feel settled, at rest, not worried. 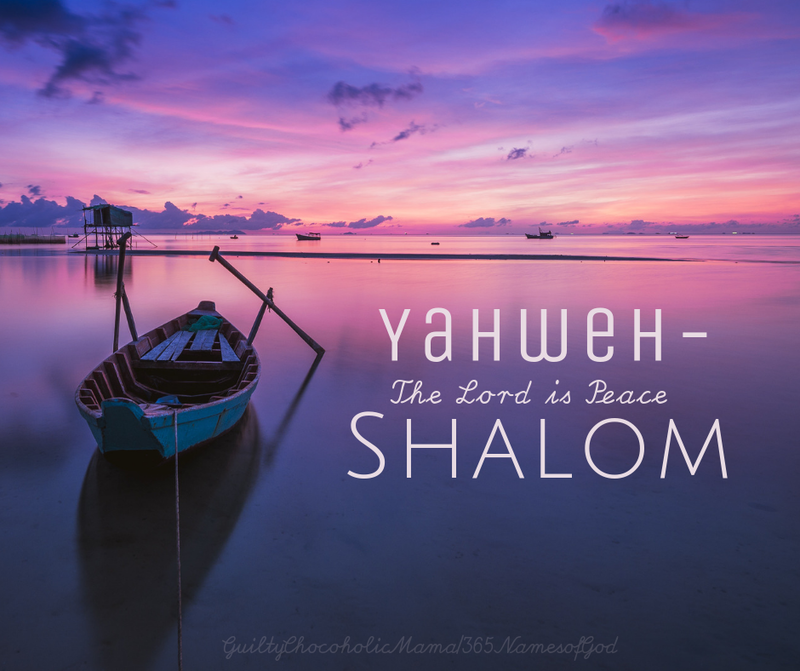 These longings often seem incompatible with life on this earth, yet when Yahweh-Shalom presents peace in His Word, He does so in the context of this world. He presents His peace as a gift: "The LORD turn his face toward you and give you peace" (Numbers 6:26). He presents His peace as a blessing: "The LORD blesses his people with peace" (Psalm 29:11). He presents His peace as a leader: "You will go out in joy and be led forth in peace" (Isaiah 55:12a). He presents His peace as a guard: "The peace of God, which transcends all understanding, will guard your hearts and minds in Christ Jesus" (Philippians 4:7). Dear NOG friends, I can't think of a better blessing to leave you with today than this absolutely lovely song. I pray you'll find a moment to listen...and to let Yahweh-Shalom gift you, bless you, lead you, guard you, and rule you with His peace. "Shalom, shalom, peace be with you. Is always by your side. Fill your heart and mind." I'm so thankful God is taking me places I've never been before on this journey through His great names. I pray He's taking you there, too. But now, I have been led in such a gentle and pleasant way to finally venture into this previously unexplored territory. According to the NIV Compact Dictionary of the Bible, by J.D. Douglas and Merrill C. Tenney, "Jeshurun" is a "poetical or ideal title of Israel." Frankly, learning this made me feel a little uneasy at first. God's affection for Israel is certain and beautiful, but don't we sometimes feel He is the God of someone else? Someone more holy or righteous or devoted? Someone whose faith is more mature or whose life is less messy? *God of the slow-of-speech Moses (Exodus 4:12). *God of the disobedient Jonah (Jonah 2:6). *God of the bitter Naomi (Ruth 2:20). *God of the worrier Martha (Luke 10:41). *God of the doubter Thomas (John 20:28). 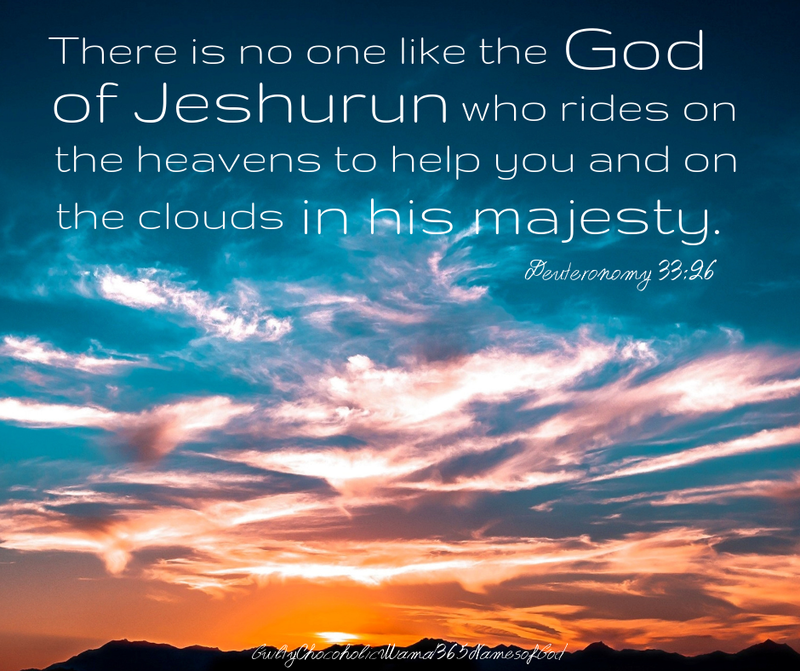 "There is no one like the God of ____________, who rides on the heavens to help you and on the clouds in his majesty. The eternal God is your refuge, and underneath are the everlasting arms." "Great" and "awesome" are a couple of words that make frequent appearances in our contemporary conversations. Perhaps "great" and "awesome" are overused in common communication, but this stop on our Names of God journey is not a condemnation of anyone's vocabulary; it is an examination of God's character. And there is no doubt that these words are never more appropriately used than in reference to our great and awesome God. "Great" as it is used to describe God implies size, importance, and power. It tells of the scope of every aspect of God's nature: His long patience and His deep love and His wide mercy, for example. Scripture often ties God's greatness to a response from us. *We respond to His greatness by worshiping: "I will sing of the LORD's great love forever" (Psalm 89:1). *We respond by paying attention: "Whoever is wise, let him heed these things and consider the great love of the LORD" (Psalm 107:43). *We respond by praising: "Great is the LORD and most worthy of praise; his greatness no one can fathom" (Psalm 145:3). *We respond by receiving what He has for us: "How shall we escape if we ignore such a great salvation?" (Hebrews 2:3a). 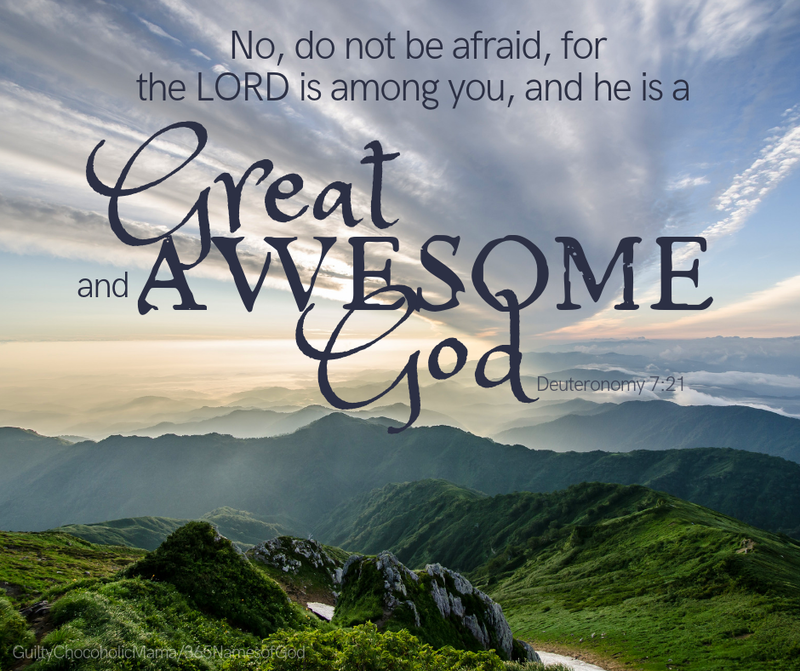 "Awesome" derives from words meaning "to be afraid" or "to revere." The Greek word that shows up in the NIV version of the New Testament as "fear" is actually "phobos," and there you see the origin of our English word "phobia." But since "do not be afraid" is God's most oft-repeated directive to us, there must be some distinction between being afraid and being in awe of God. I believe fear of God has to do with proper reverence for who He is and proper respect for what He is not only capable of doing but entirely justified in doing. When we gain the faintest understanding of who God is, holy fear and awe are not only reasonable but required. Oh, friends, however overused the words "great" and "awesome" may be in our everyday exchanges, this bears repeating: God is great, and God is awesome, and though we may speak these truths for all eternity, we will never be able to say them too much. Math is not my strong suit. I'm pretty good when it comes to using fractions to measure ingredients for baking, but other than that, math confounds and frustrates me. God-math is another matter entirely, though. God-math is when we have the chance to see Yahweh's power, love, and patience displayed in quantifiable terms that nonetheless surpass human comprehension. Five loaves of bread + two fish = a meal for 5,000 (and then some). Or 99 safe sheep - one lost sheep = a Shepherd on the search. And consider this divine equation from the Old Testament...the Old Covenant: “I, the LORD your God, am a jealous God who will not tolerate your affection for any other gods. I lay the sins of the parents upon their children; the entire family is affected—even children in the third and fourth generations of those who reject me. But I lavish unfailing love for a thousand generations on those who love me and obey my commands" (Deuteronomy 5:9,10 NLT). Even under the Old Law, look at the beautiful disproportion here: the Faithful God said that He would, in His holiness, deal with the sins of those who rejected Him for three and four generations but that He would pour out His loyal love to thousands of generations. Three and four versus thousands. One death = life for all. Great, great is Your Faithfulness. Great, great is Your Faithfulness." 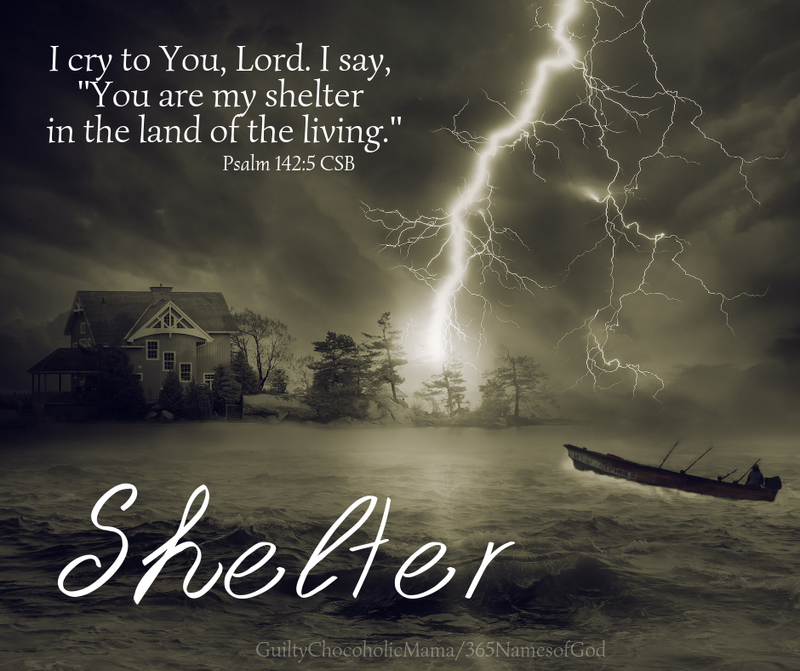 There are some names of God we want to cozy up to: Protector, Shelter, Comforter, Love. Then there are other names that might make us shrink back. 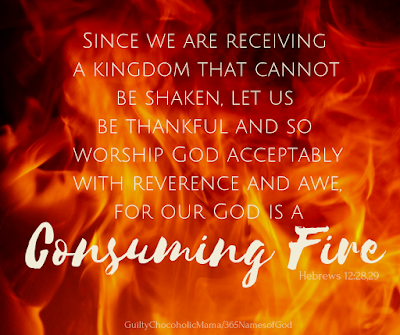 Just as we would pull away from an actual fire, we may be tempted to take a step back from God the Consuming Fire. But God is represented as fire dozens of times throughout Scripture, so it seems wise to take a step—however cautiously—toward this name. "Consuming" brings to mind the idea of something being used up, of being taken down to nothing....which could seem negative and off-putting. But as with all of God's names, if it is attached to God, it is ultimately good. And it is for our good. What does this Consuming Fire burn up? In the example of Shadrach, Meshach, and Abednego in the fiery furnace (Daniel 3), not their lives. Not their bodies or clothing. Not one hair on their heads. In fact, God was careful to inspire Daniel to record that when they emerged from the furnace, they did not even smell like smoke. The only things burned up were their bonds: the restrictions that held them in the fire. Sometimes this is what God consumes in us: things that are binding us or restricting us from living the life He wills for us. Sometimes the Consuming Fire burns up sin. Sometimes He burns up distractions that are taking our focus off what really matters. Sometimes He burns up parts of us that are weak or contaminating so that we can be refined, like gold. 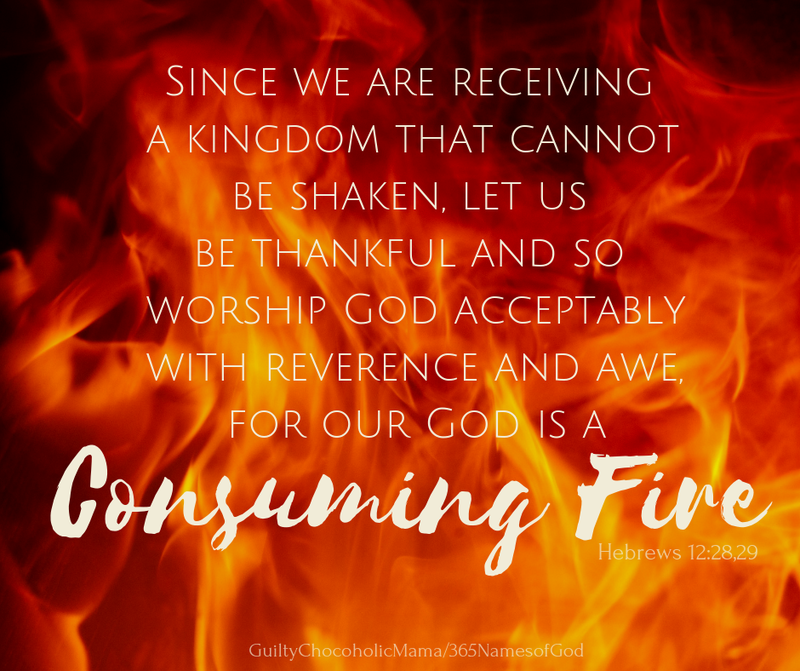 If you're feeling like the Consuming Fire is burning something up in you today, I pray you'll trust that what will emerge will be stronger and more beautiful—and that you'll lean in close to the warmth of God's love, which always feeds His holy fire. I had to go somewhere the other day I'd never been before. I'd never even heard of the street my destination was on. And I was under a time constraint, so I was nervous about finding the place and getting my tightly-scheduled teenager where she needed to go after I picked her up from where she was. I had the Google British-accent direction lady on standby, telling me where to turn in how many feet, but I didn't trust her. I wasn't sure she really knew what she was talking about. I wasn't confident she actually knew where I was and where I needed to get to. At the end of Moses' tenure as the earthly leader of the nation of Israel, we find the people of God also needing to go someplace they've never been before...and with someone new guiding them on. Moses knows they're nervous about the change of command. He knows they don't know where they're going. He knows they're worried about the enemies they'll face on the way. And so he comforts them with this perfect pep talk: "The Lord himself goes before you and will be with you; he will never leave you nor forsake you. Do not be afraid; do not be discouraged" (Deuteronomy 31:8 NIV). The Lord goes before you. He'll be with you. Don't be afraid. Moses doesn't review his own resume, and he doesn't tout the credentials of Joshua, his (godly, able, trustworthy) successor. He knows a human leader can only be in one place at a time...either up ahead or with his charges or bringing up the rear. Instead, Moses reassures the people he loves with the package deal of God's presence: before, beside, and behind. Our omnipresent, everywhere-at-once Divine Leader can be—and is—miles down the road, waiting for us at our destination AND at our side on the journey AND covering our backs from harm we cannot see. Wherever you're going today—a job you have to do, a decision you have to make, a relationship you need to feed, a hurt you need to heal, a dream you need to pursue—know that your Divine Leader is already before you waiting for you at your destination. Press into His presence beside you while you're getting there. 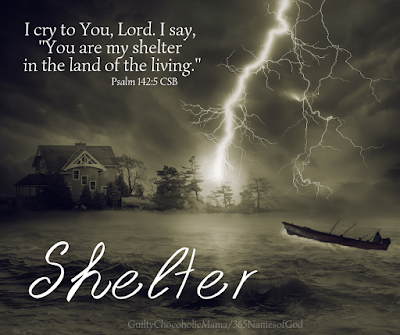 Take comfort in His protection behind you. And then walk on in courage and confidence. You are my steady hand. Your plans are always good. I will trust in You." I mentioned a couple days ago how it thrills me to come across something in the Bible I feel like I've never seen before, and it happened again with today's name. The representation of God as a jealous God strikes me as something I've known for awhile. But that His actual name is "Jealous"? This feels like brand-new information. Clearly, "Jealous" was going to be a stop on our journey, but first I needed to deal with some potentially hesitant reactions to this name. God cannot be anything that is not good. So even if we normally have a negative connection to jealousy, if God is it, it must—at least in relation to Him—be good. I also had to deal with the realization that I could not, if pressed, articulate the difference between jealousy and envy. According to the website Diffen,* envy is wanting what someone else has, whereas jealousy is being afraid that what you already have will be taken away by someone else. Of course, fear plays no part in who God is. 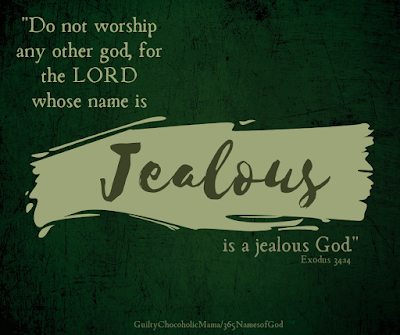 Patheos** clarifies that the Hebrew word used to describe God's jealousy is "qana," which means "jealous only for God." This is such incredible truth: God so fiercely guards our relationship with Him that His very name is Jealous. "Now this is what the Lord says—the One who created you, and the One who formed you—'Do not fear, for I have redeemed you; I have called you by your name; you are Mine.'" Once upon a time, there was a young woman fresh out of college, living 500 miles from home, working at her first real job. While she was driving to work one morning, she made an innocent but foolish mistake. No one was hurt, and it was a crime of ignorance, not of intent, but it landed her in a courtroom in front of a judge who waited for her plea of guilt or innocence. Dear NOG friends, I told my parents the other day that by the end of this series, I will have told every story of mine there is to tell. Now you've read the beginning of this one. Clearly, there is much more to it, but we have many days ahead of us; for today, suffice it to say that I know what it's like to stand before a judge who has my life (or what felt like it) in his hands. Mercifully, the judge in my case looked at me with understanding and gently offered a just and fair way out of the mess I'd inadvertently gotten myself into. 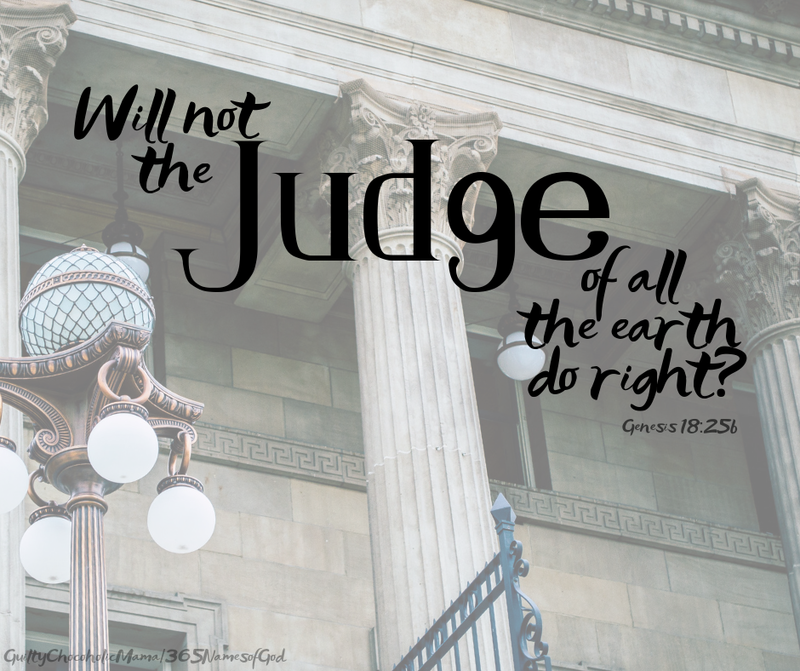 God, the Judge of all the earth, is the Chief Justice of the supreme court of the universe. In fact, He's the only one on the bench. His decision-making power is unchecked, unmitigated, and unending. But so are His patience, grace, and wisdom. This Judge looks at the innocent and the guilty and the confused and the hapless and the repeat offenders and sees them all through eyes of love and compassion. Then He renders a verdict that somehow manages to be right, complete, merciful, and effective all at the same time. Aristotle wrote, "The Law is Reason free from Passion." But our omnipotent Judge upholds His own law with purposeful passion. And all His reasons are love. 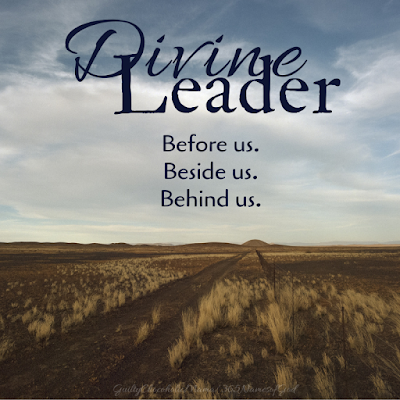 We've already visited God as the Covenant Keeper on our journey, but today we have a chance to view Him as our Keeper from a different vantage point. 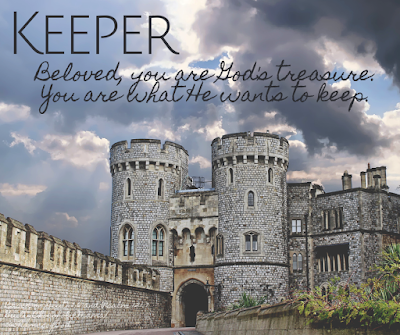 "Keeper" reinforces several other names of God we've previously unwrapped: Stronghold, Fortress, Hiding Place. But what I learned the other day about the word "keep" illuminated this role of God in a new way. In the past, I'd only ever thought of "keep" as a verb, and it does function in this capacity when we refer to God as our Keeper. According to BibleStudyTools.com, though, "keep" can also be a noun. In ancient times, the center tower of a castle was called the "keep" and was a place of shelter and protection during an enemy attack. My husband and I sometimes (half) joke about the items we'd grab in a hurry if we ever had to rush out of our house and seek shelter somewhere else. My personal Bible study workbooks are consistently on the list (which always starts with our children, of course). 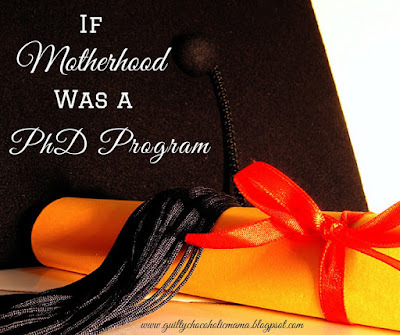 When our older daughter was pursuing her Child Development Associate (CDA) Credential her senior year in high school, we added the black, four-inch ring binder that essentially contained all her work toward that very valuable certificate to the list. My younger daughter's pointe shoes would also probably be on it. You might say these are the treasures we'd take to our "keep." Beloved, you—YOU—are what God has in His "keep." You are on His list. You are His treasure (Deuteronomy 7:6). You are what He values and prizes. You are what He cherishes and defends. You are what He wants to keep. 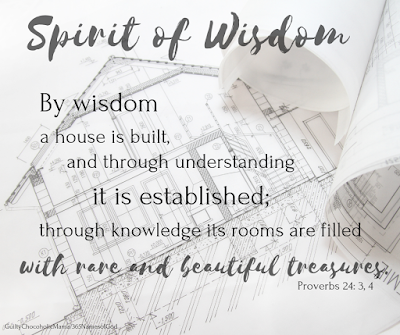 How I pray your heart and mind are wooed toward the Keeper by the truth of what you mean to Him. Keep close to Him today, for in His care and keeping is the surest and best place to be. If the Bible is God's story of who He is, what He's done, and what He's going to do, its subtitle could easily be "Love." In fact, I think we could spend 365 days just exploring this one facet of who The Great I AM is. That God is love underlies everything else He is, as conveyed by just a few of His many names. *He is El Elyon...Most High in love. 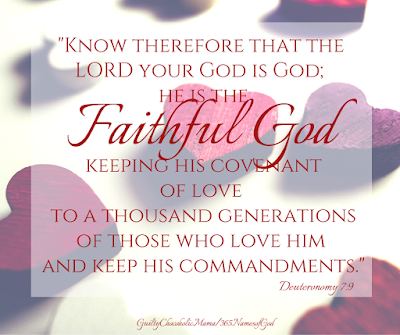 *He the Covenant Keeper...keeping his promise of love to thousands of generations. *He is Yahweh-Tsidkenu...God Who Makes Us Righteous With Himself for the simple and yet profound reason that He loves us. *He is Emmanuel...the God who came to be with us because of love. *He is the Word...and the word He speaks first and foremost is love. 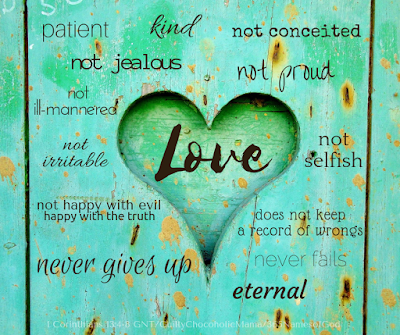 One of my all-time favorite quotes is this one from St. Therese of Lisieux: "It isn't enough to love. We must prove it." God proved and proves His love over and over. The question I need to ask myself is, "How will I prove love today?" How will I prove love today? Here is where God's way of doing things is so radical and redemptive: I prove my love for God not to earn His love for me but in response to it. I prove my love for God not to get something from Him but because of what He has already given me. "This is the kind of love we are talking about—not that we once upon a time loved God, but that he loved us and sent his Son as a sacrifice to clear away our sins and the damage they've done to our relationship with God. 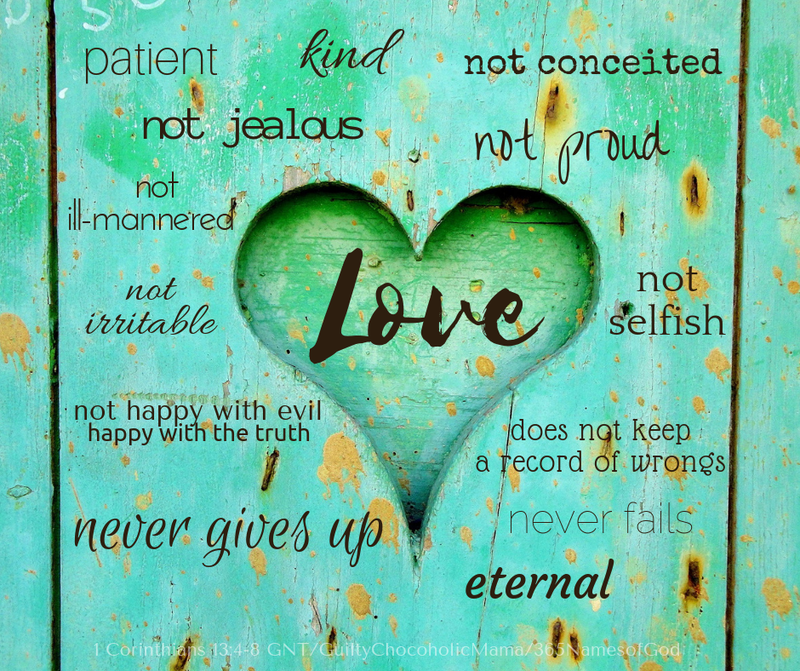 My dear, dear friends, if God loved us like this, we certainly ought to love each other" (1 John 4:10,11 MSG). God's love story goes well beyond "once upon a time." Its ending will really be just the beginning. And "happily ever after"? We can't even imagine. "Dwell" is one of those words you don't hear a lot in ordinary conversation. "I dwell in a blue farmhouse"? Probably not. But the word is so rich in meaning that it seems entirely appropriate used in conjunction with our extraordinary God. The Old Testament Hebrew words translated "to dwell" or "dwell" mean "to sit" or "to remain" and convey the idea of a permanent stay. And oh, how I love the way these meanings are reflected in the light of Psalm 90: "throughout all generations" and "from everlasting to everlasting." Dwelling makes me think more of being than of doing and more of security and steadiness than of an address or structure. 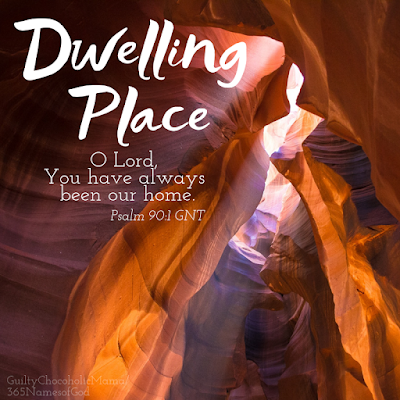 God is our dwelling place because with Him, our hearts are truly at home. We feel at peace with Him. Today's mile marker on our Names of God journey reads "Day 70." The number seven often represents completion in the Bible, and while I trust we still have many marvelous miles to go before this series is complete, today feels like a good time to share a little background I'd love for you to know going forward. Several kind encouragers have asked if I have all 365 days and names already finished. Spoiler alert: I don't. 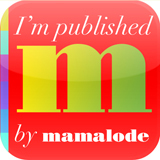 I have a year's worth of names chosen, but I am essentially writing the daily posts as they come up. For a while, I thought, "If I could just get one day at home when I didn't have to go anywhere, I could write NOGs like crazy and build up a stockpile." I did get a day at home (thank you, Polar Vortex), but did not amass a stockpile. 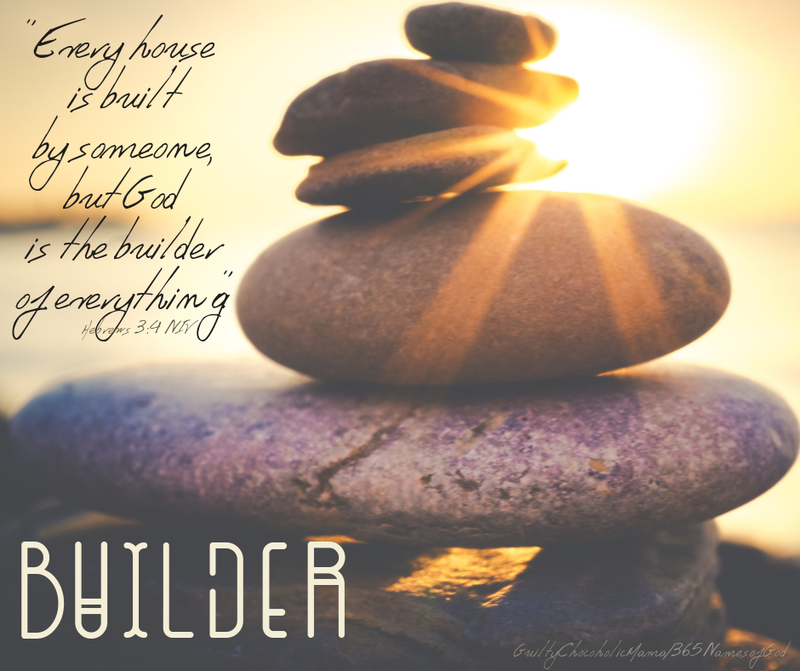 So I've come to look at this project as my own "manna in the wilderness" experience: my Portion gives me just enough insight and leading about His names for one day at a time. As He has every right to do. And as He did with His people after they had come out of Egypt and He warned them to collect only enough food for each person for each day as it came. 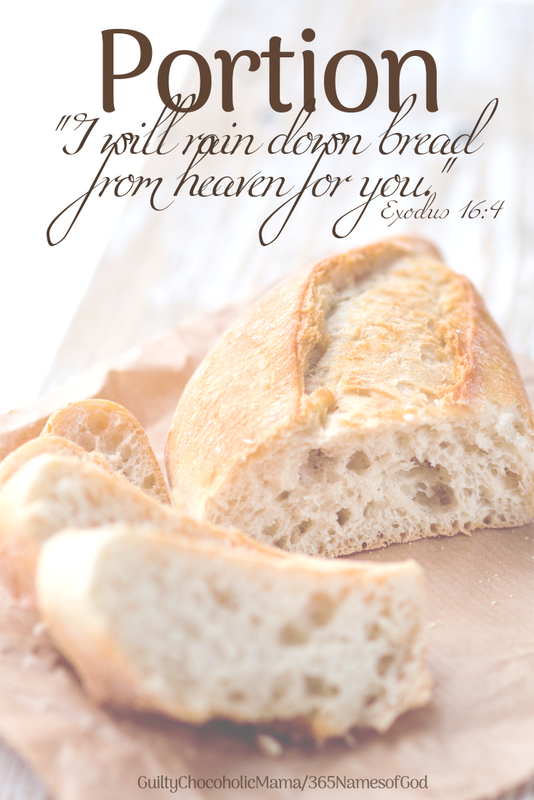 Our Portion is God of the daily details—"in the morning you will be filled with bread"—and God of the eternal big picture: "Then you will know that I am the LORD your God" (Exodus 16:12). All of that was a long way of introducing a specific example of God's supply for this journey...one I'm sharing for the express purpose of encouraging you, dear friends, as you seek to trust in Yahweh as your Portion. I'd already decided on "Way-Maker" for Day 68. On the morning of Day 67, I sat down at my computer to start working on the next day's post, which I intended to build around the story of God parting the Red Sea. I turned on my monitor and pulled up the online streaming of our local radio station for background music...and stared at the name of the song listed as "currently playing": "Split the Sea," by Hannah Kerr. "Split the Sea." SPLIT. THE. SEA. I've heard it said that a coincidence is God working anonymously. And He surely does that. But He also often works in plain sight, His provisional power on full, faith-feeding display. He is our Portion forever. 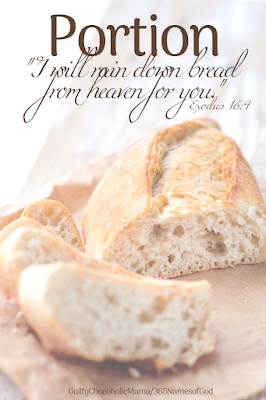 He is our Portion for today. 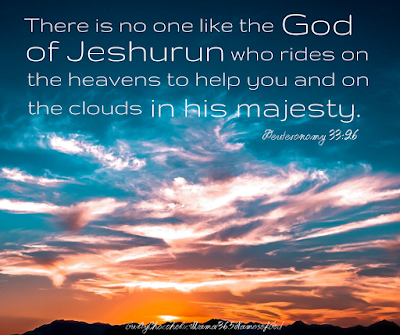 When God's chosen people first set out on their journey of freedom away from the Egyptians, Yahweh provided divine GPS via a pillar of cloud by day and a pillar of fire by night. Sometimes I long for God's leading today to be as obvious and unmistakable as those pillars. Yet what He provides now is so much better, because that ancient guidance was for a specific group of people at a specific time, whereas His present guidance is for all people, at any time. Over the course of my life, I've collected a few stepping stones to help me try to figure out if my Guide is leading me down a certain path. This is not some express highway of decision-making, but maybe it will provide a little sure footing for your journey, too. A ~ Ask God what He thinks. This is otherwise known as prayer, and I know it's an obvious stone to start with, but you might be surprised at the number of journeys I've started off on in my life without consulting God first. B ~ Be aware of holy nudges. These are those little Holy Spirit twinges in your mind or that emotional sore tooth that keeps pinging, either steering you further down a path or halting you before you take another step. C ~ Carefully consider God's Word on the matter. The antiquity of Scripture does not diminish its present authority or applicability. 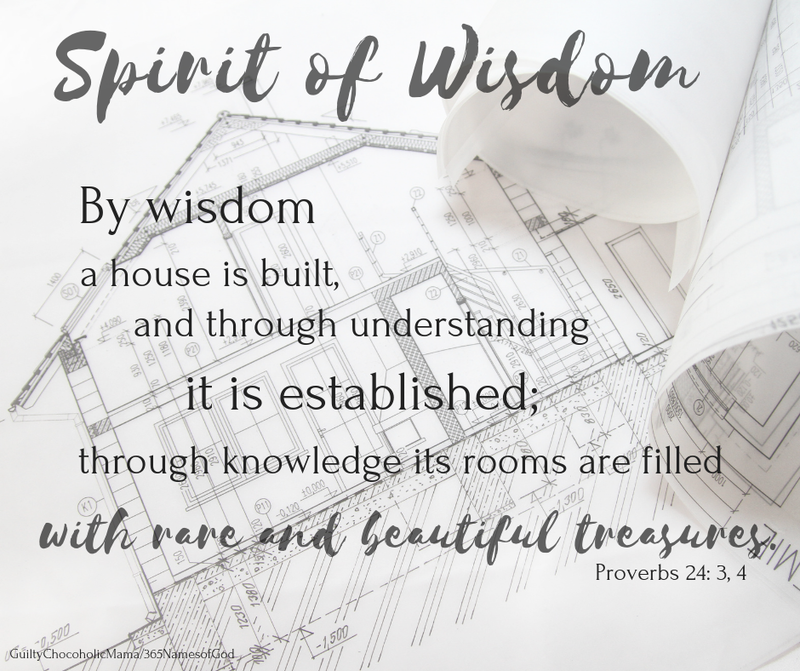 D ~ Draw from the wisdom of careful counselors. Mature friends of faith, trustworthy clergy members, teachers of truth...God can use all these human pillars to lead us along. E ~ Expect God's confirmation. Our loving Guide wants us to know His will. It's not as if He's clutching it to Himself, shrouding it from us and hoping we won't guess what it is. 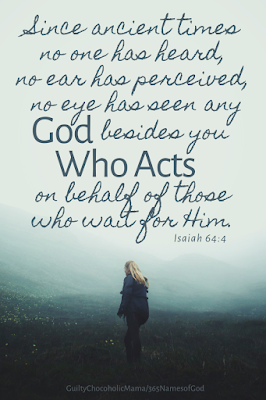 Earnestly seek His direction—and then wait in confident expectation that He will give it. "Then you will know which way to go, since you have never been this way before" (Joshua 3:4 NIV). How many times have I said this in the face of a seemingly impossible situation? Certainly the newly freed Israelite captives must have had that thought when they were looking ahead of them at the expanse of Red Sea and over their shoulders at the advancing Egyptian army. And, in fact, there wasn't a way...until the Way-Maker made one. Again and again throughout Scripture, we see examples of God making a way where there is no way. We might wonder why He so often chooses to work drastically. He could, after all, have led his people out of Egypt along an easy, clear-cut path to freedom. He could have plucked Joseph out of the cistern his brothers threw him into and sent him merrily along back to his father. He could have healed Lazarus' sickness long before it ever landed him in a (temporary) grave. But just think how many wandering souls across all generations have looked at the example of God parting the Red Sea and have found their own faith and hope and courage emboldened by it. This would not have been the case if the path had been smooth and obvious. There would not have been such a story to tell. 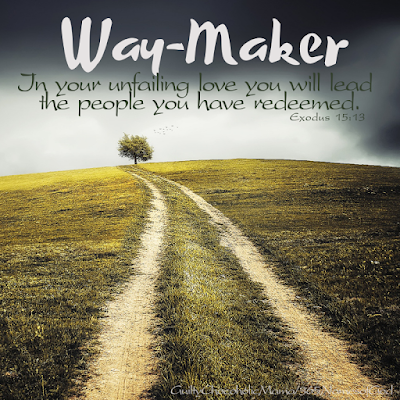 The Way-Maker wants us to be in awe of Him and what He can do not because He's on some kind of egotistic power-trip but because He knows reverence for Him keeps us correctly connected to the Source of true power. The next time I fall into thinking, "There's no way," I need to remember the Way-Maker and reframe my thoughts: "I may not be able to see the way right now, but I can look to the One I know is making it."